Christian Bale. Bradley Cooper. Amy Adams. Jeremy Renner. Jennifer Lawrence. Michael Pena. Robert De Niro . Based on the Abscam sting operation of the late 1970s and early 1980s, the story follows FBI agent Richie DiMaso as he blackmails conman Irving Rosenfeld and his lover Sydney Prosser into helping him after a successful investigation into the pair's own foreign banking scam. Although DiMaso's sights are initially set on New Jersey Mayor Carmine Polito, the investigation is broadened to include a number of Congress who are suspected of taking bribes. 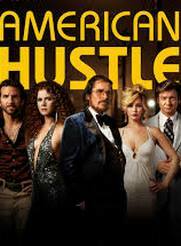 An amazing cast, some mind boggling hairdo’s and no small amount of intelligent script can’t take away from the feeling that ‘American Hustle’, like its characters, is a wee bit shallow. Still good mind, just not great.